One of the main things players will do in God Wars V is build and diversify their armies. Trainable soldiers fall under one of four archetypes: Melee, Ranged, Magic, and Cavalry. These archetypes expand upon the Combat Triangle we all know and love. All standard troops start at Tier I. Using certain buildings, they can be upgraded to Tier II and Tier III, receiving more Attack and Defense points as they do so. In order to be upgraded, soldiers must move to a Settled or Advanced region with the appropriate upgrade structure and 25 Gold must be paid for each man. With no recruitment modifier, players can recruit up to 2,000 soldiers each turn. The recruitment modifier multiplies the maximum number of troops you can recruit in a turn. However, the recruitment modifier is determined by the settlement itself, so it's not empire-wide like resource modifiers are. This means that players must announce in which settlement they are training troops. Example: If Lime wants to recruit in his starting town, and it has a recruitment modifier of 1.0x, the maximum number of troops he can obtain is 2,000 * 1.0 = 2,000. If he manages to capture a large city like Pollnivneach and it grants a recruitment modifier of 1.4x, he can train a maximum of 2,000 * 1.4 = 2,800 soldiers in that city. He doesn't have to train all 2,800, of course, but the maximum limit is raised by the modifier. Whether he chooses Nardah or Pollnivneach, he'll have to announce his pick: "I train 2,800 Swordsmen in Pollnivneach." One more thing to note: All standard soldiers will take one season to train and become ready to incorporate into an army. Special troops, siege engines, and ships may take 2 or more seasons. Siege Engines differ from regular troops. They are not limited by the 2,000 soldier cap, only by the resources available to build them! During a battle, they have unlimited ammunition. Ships are a combination of basic troops and siege engines. They aren't limited by the recruitment cap, but they require a Dockyard to be built in. Battles continue until one side is destroyed or routed. You can command you troops directly so long as you have a Commander on the field. This military Agent can fight alongside any soldiers in the battle, though he uses melee, and comes with a small unit of 10 bodyguards. If he's slain, and there's no secondary Commander present, control is transferred to the Battlemaster for an auto-resolution. You can edit a battle turn up until the end of the Battle Round; that is, up until the BM posts the summary. Reinforcements for both player and NPC factions can be brought in after 5 BRs. Depending on the layout of the battlefield, they will enter from a certain direction and may be stopped from joining the main army if the other participant is quick to intervene. When the battle is finished, both participants can conduct a management turn. If they decide to clash again, they'll start a new battle. One important aspect of battles is Morale. This statistic measures an army's willingness to fight. In practical terms, it affects how well individual soldiers fight; generally, high Morale makes them calm and confident, while low Morale may cause them to make mistakes or poor decisions. This is not universally true, however, as some warriors find the inner strength to fight better when the odds are stacked against them. Morale is both positively and negatively affected by events on the battlefield. Large shifts in Morale are called Morale Shocks, and they occur when something particularly surprising happens. The most common Morale Shock happens when an army sustains a high number of casualties very quickly. A positive Morale Shock may occur if, for instance, a formation surrounded by the enemy manages to survive until help arrives. Some soldiers and siege engines are limited to Line of Sight. This characteristic dictates that the soldier/siege engine launches attacks from range in a straight line and cannot arc his/its projectiles over objects or friendly units. Example: If you order your Cannons (LoS siege engines) to fire at a group of enemy infantry when you have troops in the way, your troops will get hit instead! Magic can be utilized by Mages and War-Monks on a small scale, but with the use of a Nexus, it can also be used to cast Major Spells. These spells have a high Rune cost, can only be channeled through a Nexus, and require one or more Battle Rounds to cast, but strategic use of their powerful effects can often turn the tide of a battle. Firestorm is a destructive Major Spell that conjures a broiling conglomeration of flame in the clouds directly above a targeted location. When the spell is ready, hundreds of fireballs rain down and deal massive damage to anything that is exposed. Very effective against troops and anything not made of stone. Aegis is a protective Major Spell that casts a domed barrier around the Nexus that is channeling it. This barrier will absorb the kinetic energy of magical or high-velocity projectiles that impact it, but will not stop low-velocity objects (such as soldiers marching) from passing through. Note that this property applies to both the interior and the exterior of the shield. Aegis will break after sustaining a set amount of damage, or after 3 Battle Rounds; whichever comes first. Additional Major Spells can be developed through research, and there are rumors that NPC entities have concocted Major Spells of their own. I move to remove the priest unit and replace it with simple "support mage". I don't want people using priests as emissaries or somesuch. (Just a rename). True, but "support magic" makes me think of Lunar Spells. Perhaps just be more specific and call them Battle-Priests? Also, I'm slightly sick today and may not have been thinking straight when I included a season for training. Do you agree with it? We need to go through and decide which actions are instantaneous (the result applies in the same turn) and which take one season (the result applies after a Seasonal Report). Training should take a season, yeah. Awesome. I think it's easier to do multi-turn units this way, like ships. Anyways, looks pretty good. Doesn't look like there's many changes except a new font color, renaming Pikemen, and making it so that Priests don't die to EVERYTHING. And also the recruitment thing. I dunno, I'd like the Troops, should a city be under attack, be able to spring right into action from training, as to help defend the city. Maybe so that they can only be moved the turn after they're recruited. Well Lime, a city under attack should have a sizable garrison before the enemy gets there. However, we could easily add an "Emergency Militia" system in which civilians can take up weapons, but they'd be less effective than fully trained soldiers. It should only apply in Advanced regions, though. Ehh... I don't really like the emergency militia idea. By the way, I'm thinking that battle rounds should be pm'd to the battlemaster and not posted directly onto the thread. This way neither side knows what the other is doing, promoting tactical superiority and ability to think ahead of your enemy. When the resolution has come, the battlemaster posts both of the two turns (except for secret orders, of course), and the resolution in one go. This would come with another thread-related change, which would be the separation of actual turn posts and such from discussion. It'll be a button easier if we had a separate thread for everyone's turns and the discussion. then we won't even have to moderate or restrict the discussion much, for example for criticism and arguing about my or the battlemaster's decisions. Now, since players in pvp don't know what the other side is doing, Siroki, I will demand you always formulate the npc strategy before you see the player's turn. I don't want knowledge of what the enemy is doing influence your decision. On a separate note, I disagree with mages requiring line of sight. You're basically nerfing them to be worse than archers. Oh, and pikemen should be effective against ranged, not melee. Pike-wielding warrior will be seriously outmatched by a warrior with a sword, since the pikeman can only land one hit before the enemy is too close and his long weapon is too long. Besides, with those strengths and weaknesses, the melee troops will take a beating from everyone - magic, cavalry, ranged and even other melee troops. 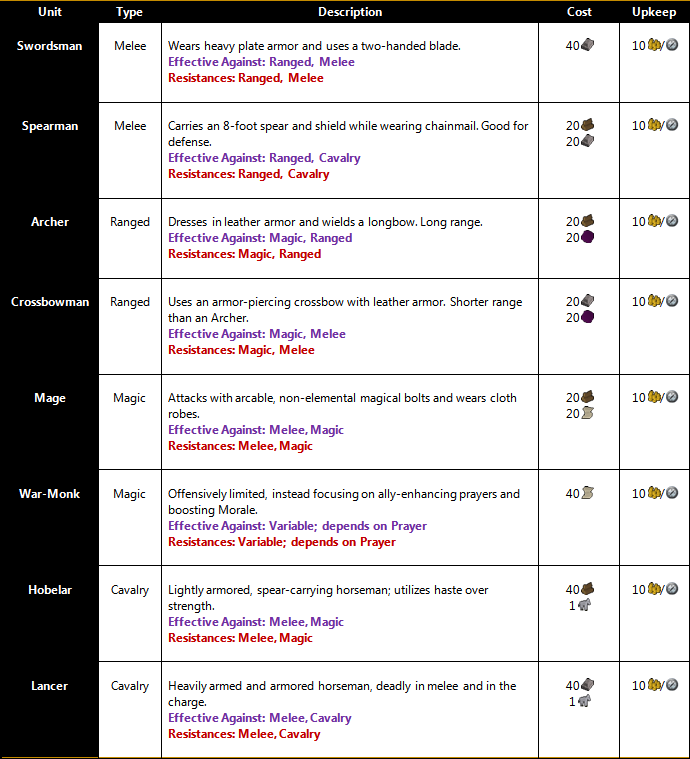 I've been contemplating on giving melee troops an additional lifepoint, since they do not have a ranged attack, unlike rangers and mages. Mages should not require Line of Sight. Secondly, Turn Posts and Discussion were supposed to be restricted to PM, but we all know that won't happen. Thirdly, no, I feel like Battle-turns are fine the way that they are. Afraid? It makes more sense when you don't know what your opponent is doing. Besides, it weeds out the good players from the best players and rewards better tactics more than people sitting around and waiting for the other guy to post so he can just outright counter their strategy. You need to plan ahead. I agree with PMing battle turns AND having a separate thread for discussion. Veylantz can be demoted from a moderator of Forum Games and William can take his place, so we can delete discussion posts from the main thread (or move them to the discussion thread... I think we can do that...). There is nothing pulling on a magical projectile to bring it back down to the ground. Earth and Water spells might be able to be arced, but Air and Fire should be LoS. Why should my Mages, who have the most versatility in attack capability, be able to sit back behind the infantry lines and lob spells all day? If you want them to be effective, put them on higher elevation where they can rain down destruction unimpeded. If we change it so that Mages use only one type of elemental spell (fire is fine), I'll remove the LoS restriction. Cannons could technically lose their LoS restriction, as the cannonball will eventually fall down, but it's moving so fast that I decided against that. As for Pikemen Spearmen, I made them effective against Melee because of their shields and shorter polearms (I'll edit the description, as it sounds a bit misleading. Their spears are 6-8 feet long). I absolutely agree with giving Melee troops an additional life point, except if someone makes a lightly-armored Melee unit. The idea is that both Swordsmen and Spearmen have, at the very least, chainmail and leather, with the Swordsmen having more platemail. Tech Idea: Mages on Stilts. All joking aside, There is no feasible way to remove discussion from the God Wars Thread. There will always be people like Toa and Me spamming up the thread with our discussion. I meant, make a separate discussion thread, not just "stop talking pls!" If it goes to that, I'll ask Robo for moderation rights on Forum Games, lock the main thread and tell everyone to pm me their turn posts for posting. William, would you mind sharing some early numbers you had for Attack/Defence values for the standard troops, siege engines, and ships? I want to see if I can squeeze them into the table. Also, was there some way you wanted to incorporate range? Basic troops have 1 damage point and 3 lifepoints. Simple as that. Catapults deal 300 damage, cannons deal 500 damage and both have 450 lifepoints, siege towers have 1,200 lifepoints and rolling shields have 3,000 lifepoints. I haven't yet decided on the ships, since it's not something I need to worry about yet. However, I'm thinking something along the lines of a full load of cannons and troops being 1/3 of a ship's damage. (Meaning that a ship in itself would deal twice the damage of just the full load of troops and siege machines.) And the lifepoints being adjusted to that. Range isn't a real mechanic here, just something up to the battlemaster's discretion. Basically Catapults > Cannon > Archers, mages and Crossbowmen > Melee troops. Melee troops that are advancing on the enemy are something the gamemaster decides, that is, do they get into range in a single battleturn or no and all that. Siroki, do you think you could scale your maps somehow and create a speed/range system? I'm leaving this up to you, since you'll be the battlemaster in God Wars V.
Sounds good, but should melee troops get at least 1 extra lifepoint because they can only attack in close quarters? Right, yes, give them that. I don't think cavalry needs it, they're so fast anyway. Time for more table finagling! Well, after Construction. Boy, I really don't get many opportunities to use that word. 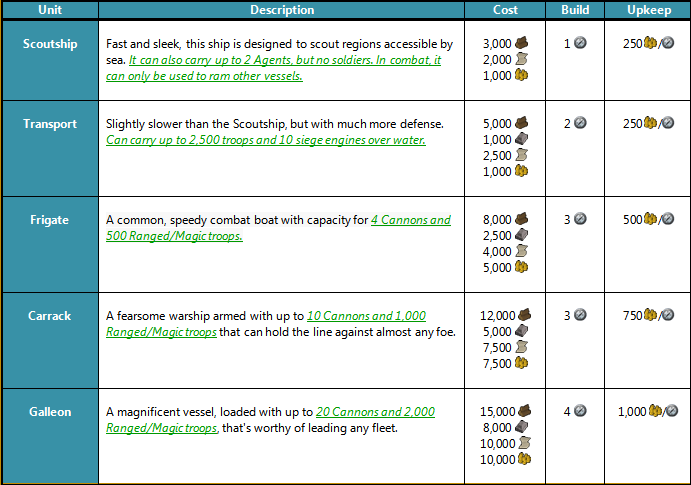 Uhh... After I took a look at some numbers, I realised that cannons and catapults are ridiculously overpowered. Hence their effectivenesses are halved. Thank goodness nobody actually used any siege weapons in any battles so far. Siroki, I need to talk to you about recreating the entire combat system anew. We need to find out how sophisticated we can get with it. Sounds Gooot. Trough which medium, though? Alright, during a (long) conversation with Siroki, we have now rebuilt the entire combat system specifically for the God Wars V. This system is only made possible through Siroki's contribution of providing us with battlefield maps that are in scale with distance. Yet while distance is all nice and useful, we also need a scale of time. These two measurements have allowed us to create as realistic and minimally biased combat system as possible. I will now explain its principles. We have two new measurements, a measurement of distance, a Siroki; and a measurement of time, a William. The broad definitions of them are as follows: a Siroki is one 2,500th of the distance between a default-sized battlefield's two opposing edges, and a William is one hundreth of a default battle-turns length. In addition, in a formation of regularly spaced soldiers, each soldier consumes 100 squaresirokis of room. With the two new measurements, we've been able to create two new things to add to the list of mathematically determined things. They are range and movement. In the current iteration of the game, both are something the battlemaster judges on a whim. However, now we can proudly say they are something we can fairly and traceably decree. The equations are solved to the respective unknowns we want to achieve with them. Well, that doesn't look tedious at all. Well, anyway, those are the lot. Damage can only be calculated against enemies with the same type multiplier (that is, an attacking archer's damage can be handled in one go if he's attacking a mixed group of archers and mages, but not if he's attacking mages and warriors). The way I suggest battles to be handled is breaking it into points where something happens, calculating everything that's happened up to that point, then check the next point of what's happened. Say, I have a batallion of mages and another of swordsmen, whereas Lime has a batallion of archers killing my mages. I order my swordsmen to go and kill the archers. The battlemaster would calculate the time it takes for my swordsmen to reach Lime's archers, then checks the casualties my mages inflicted on the archers and vice versa, and then proceeds to use the remaining mages and archers in the next part of the battleturn, in which the swordsmen can join the fun. Since no points of interest exist during the rest of the battleturn, the damage is calculated based on the remaining time after the swordsmen reached the archers. Wow, that was a complicated explanation to say the least... I'll take a look at specific troop numbers later. » does the military still use transistor radios?